Graeme - This place has become my 'go to' favourite when returning to the King's Cross area after a walking day out in London. It doesn't look to be anything special but the food (esp. the main courses) and the service are excellent. As per the previous CurryMarks visit, I don't think I made the best choice for starter. I went for the Garlic King Prawns which were tasty but there wasn't much to them volume-wise. My main of Garlic Chilli Masala Chicken was lovely and quite spicy. As could be expected, my double garlic selection did not go unnoticed by Mrs S.! I was impressed that they had large bottles of three different beers - a pleasant change after the extortionately-priced small bottles offered at two recently-visited restaurants. I think I had a good time but an early drinking start (first to the meeting pub having had a couple already) after a tiring and emotional day combined to send me to sleep at the table - I did at least finish my meal first. Dave - Not bad. Not top six. Neil - Bit of an odd curry house, lots of people popping in for a single course on their way to and from Kings Cross Station, normally with luggage. I guess as they're used to individuals and pairs, accommodating nine of us was a big ask, hence the slow service. That said nothing was burnt or overcooked and we didn't finish too late. Food was above average and even though I didn't have much of an appetite I managed to finish it all, a good sign. Big beer bottles and a free Baileys made it all go down very easily as well! 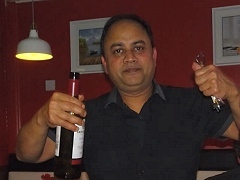 Richard - The Gulab Tandoori was great little place with friendly waiters. My mixed starter was average, but the mixed biryani was very good with a fine veg curry to go with it. The best keema nan I have had (although I don't normally have them), with a good beer selection. Let's go back next year! 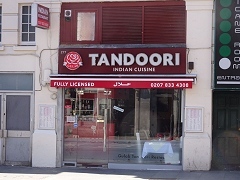 Jon - I wasn't overly impressed with the Gulab on our first visit, and it didn't improve. The food was fine, and I did think my Lamb Suka main was very tasty, but it was only luke warm when it came up. That was the biggest issue for me - large groups are difficult to serve but you should be able to keep everyone's food hot and I'm sure that main course dishes were still being brought out 15 minutes after the first. Handy for the train, though. Jeff - Good performance from this small restaurant. Very good service and choice of beer. Food average or slightly above, and altogether I'd be happy to return. It's on the fringes of the top 6 and probably will remain 'there or thereabouts'. Thanks to Jon for the Dallas quiz! Mark - Starting with an end of term drink we strolled up to the Gulab which is situated next to the old Kings Cross Thameslink entrance. Not a great spot but seemed to have a reasonable number of patrons as well as us. Unpretentious place (no #hashtags to be seen!) and had a more traditional feel than some of late. Starter of Chicken Pakora was good and probably the nuggets referred to in a previous review. My lamb main was tasty but a bit meat lite. Rice a touch dry for me. With a group of 9 and few staff it seemed they struggled to get all the food served together whilst still hot which marked down the otherwise good service. Some good banter but I might join Graeme in falling asleep next time if we spend half an hour talking about a TV program from the 80's I never watched - get a life! Good beer choice but a tad expensive overall I thought. Dominic - I'm a big fan of this eatery and tend to visit off-piste during the year. Although it is small it is modern and comfortable and the manager is always welcoming and attentive. The menu is quite extensive but reading last year's notes I went for the mixed starter which contained onion bhaji, kebab, tandoori chicken and lamb tikka which was tasty and plentiful. For main I chose the King Prawn Phall which was excellent being the best I've had! All the rest was good and the wine well priced. And a free round of Baileys was also a nice treat. Overall, another excellent night out punctuated by Griff's "highbrow interior design" discussion of curtains and carpets.